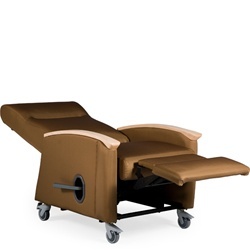 Healthcare seating combines "At home" comfort, with caregiver convenience and cost effectiveness. Our healthcare seating is designed and manufactured to provide patients with in-home comfort that includes infinite position reclining capability, ergonomically designed lumbar and lateral cushioning and on selected models, a patented rocking mechanism. We provide you with the care-giving convenience of features that include adjustable side trays, full flatbed reclining, IV pole mounts, single-touch locking casters and a rear push bar for easy steering. This dedication to product performance has produced more patented features that any other healthcare seating choice on the market today. Comfort, convenience and cost-effectiveness, it all adds up to OFConcepts. Perfect for healthcare applications, along with public common and high traffic areas the Amherst Series offers a 1" separation between the back and seat for easy cleaning. Available in numerous healthcare grade vinyls, this line is easy to clean and disinfect. The Belmont Series Healthcare Vinyl Reception Seating is a perfect solution for reception areas that need the ability to be easily cleaned and disinfected. The refined leg design gives a beautiful modern look to any space, which is then finished off with your choice of wood finish and vinyl. The Classic Series Healthcare Vinyl Reception Seating is available in a round back, full back, ergo back or open back, as well as an extended arm option. Choose from a wide variety of healthcare vinyl colors and styles that can easily be cleaned an disinfected. The Contour Series is available in many healthcare vinyls. 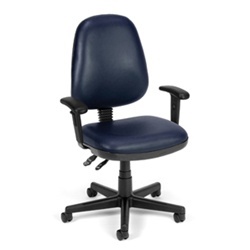 You can also select from an ergo back, round back, full back or open back. Mix and match back styles to furniture your entire office space, while using the same vinyls throughout. Style, function and affordability can all be found in the Lenox Series Healthcare Vinyl Reception Furniture. Available in a wide range of healthcare vinyls to fit any decor, this seating is easy to clean and disinfect because it features an open back. The Madison Series from Lesro is a traditional styled reception furniture series that is available in a wide variety of health vinyls. 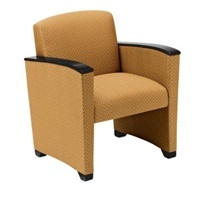 This series features plush layered foam seats, along with a rolled arm design on all seating. Lesro's Savoy Series is tailored for a stunning first impression and engineered for long life performance. This fully upholstered series comes standard with a 400 lb. weight capacity per seat and the option of numerous vinyls, along with wood finishes to match your designated area. The Weston Series from Lesro offers a large variety of solid color and printed vinyls to meet the needs of the space you are looking to create. All seating and occasional tables are constructed of solid hardwood and available in a wide variety of finishes. The Ashford Series Healthcare Vinyl Reception Furniture is made of solid hardwood construction, which includes matching table tops. This series is available in hundreds of healthcare vinyls which can be paired with your choice of wood finish to create the best combination for your space. The Mystic Series from Lesro offers a collection of metal, wood and fabric combinations to outfit any reception area. They also offer tapered back and tapered split back models. Healthcare vinyls allow easy cleaning and disinfecting. A refined leg and open arm styling make for a great combination in any reception area and the Brewster Series Healthcare Reception Seating has both. Available in a wide variety of healthcare grade vinyls, this series is sure to make the perfect first impression. The Franklin Series Healthcare Vinyl Reception Furniture offers an open back design, which along with the healthcare vinyl allows you to easily deep clean this furniture. Ideal for healthcare facilities, this series can also be used for high traffic areas that need to be disinfected from time to time. Ravenna Series Healthcare Vinyl Reception seating is a fully upholstered series with unlimited vinyl and finish options. Vinyls provide a space that can be easily cleaned and disinfected, while keeping a modern, stylish feel in any space. The modular design of this system allows for complete layout flexibility. Traditional styling with rosette detail is what the Hartford Series Healthcare Vinyl Reception Seating can offer any office reception area. Available in a wide variety of healthcare vinyls, this series can be configured in both colors and layouts to fit your specific needs.